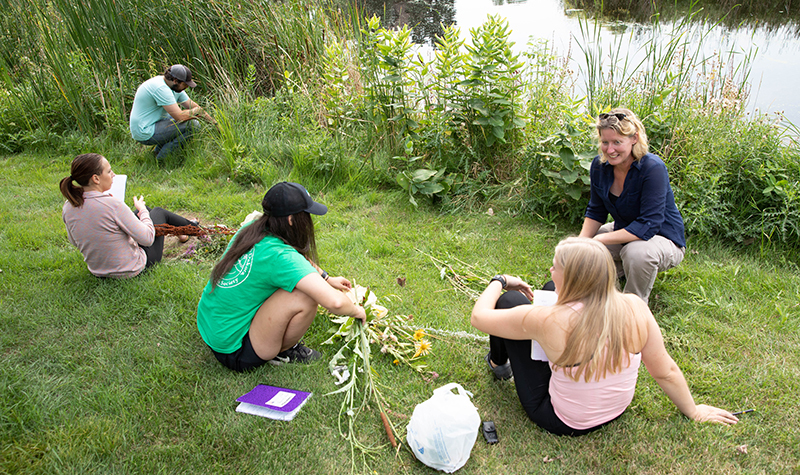 On several grassy acres near I-29 owned by the UND Aerospace Foundation, aerospace engineer and UND Aerospace faculty member Pablo de León leads a student team that’s assembled a series of “space” modules meant to simulate the closed environment of a planetary station. In this case, Mars. It’s all part of an ongoing research project—the only one like in the nation—funded by the National Aeronautics and Space Administration (NASA) as part of its ambitious long-term plan to establish a human colony on Mars. This UND-based project—the Inflatable Lunar-Mars Habitat, or ILMH—has been built and worked on by students. The heavy-duty fabricating and welding of all aluminum infrastructure has been done locally by Grand Forks Welding, which delivered the final plastic-sheeting wrapped unit to the ILMH in June. 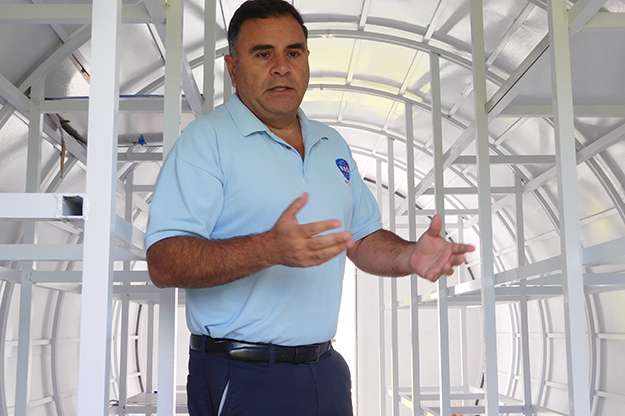 “There are now a total of five modules, configured like an actual Mars base—a living module; an extra-vehicular activity (EVA) and maintenance module; a plant production module; an exercise and human performance module; and a geology module,” said de León, who besides his faculty appointment is director of the UND Human Spaceflight Laboratory in the John D. Odegard College of Aerospace Sciences. There, he and his team work on designing and building the planetary exploration suits essential to survival in the thin atmosphere of Mars, which is 96 percent carbon dioxide. Additionally, two vehicles—also designed and built by UND Space Studies students—a crewed four-wheel electric powered rover and a four-wheel drive electric powered robotic rover. 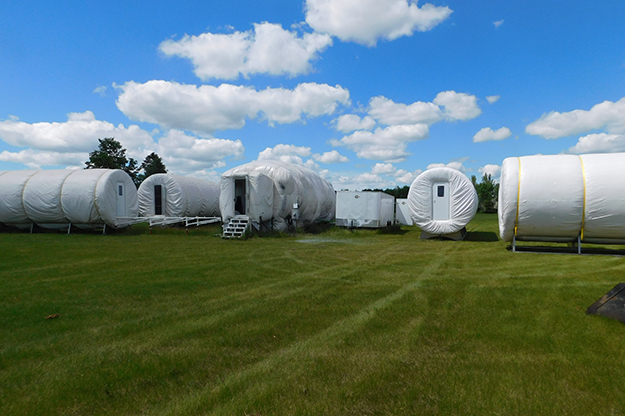 The UND-based and designed Inflatable Lunar-Mars Habitat, or ILMH—was built by students, under the guidance of de León. The heavy-duty fabricating and welding of all aluminum infrastructure was done locally by Grand Forks Welding, which delivered the final plastic-sheeting wrapped unit to the ILMH last month. Photo courtesy Juan Pedraza. The core of this five unit project is the living module, where crew will spend a good portion of their time. The EVA and maintenance module is the workshop where the crew will perform both routine and emergency repairs and maintenance on suits, modules, rovers and other equipment. The plant production module is all about feeding the crew—of course, this means a plant-based diet. No room for meat animals. 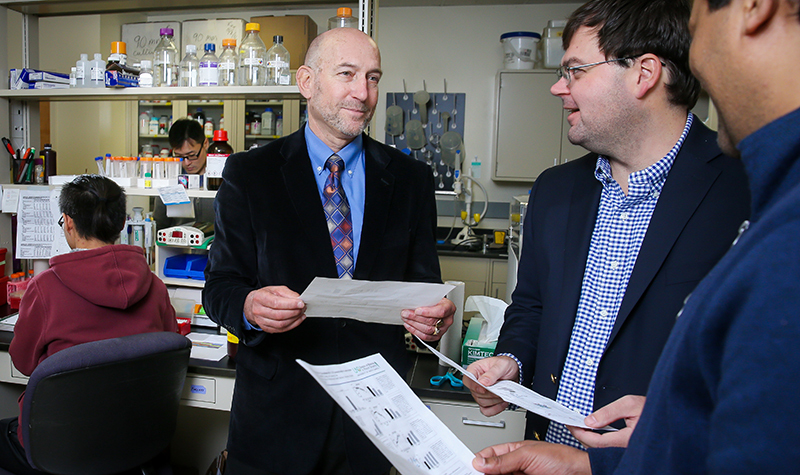 “The plant production module will house trays of plants under LED lights specially designed by NASA,” noted de León—who said the Space Studies graduate degree program always has far more applicants than the program can accept. The exercise and human performance module will house special exercise machines with systems that will feed information to NASA; the agency will be able to perform real-time monitoring of the health status of persons in the module. The geology module is for experiments and for developing techniques for cutting Martian rocks that may contain contaminants such as toxic perchlorates that should not be inhaled—particulates could be released as the rocks are gathered and cut, so the crew must process samples in a glove box. De León explains the inner workings of the ILMH. Photo courtesy of Juan Pedraza. De León speculates that ultimately, small nuclear plants will generate the power for a Mars-based station like the one being tested at UND. The density of Mars’ atmosphere is low so nothing heavy can be moved by winds, so wind power is out of the question. 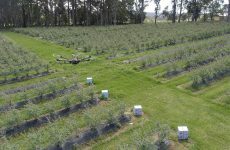 The project was first funded in 2009 by a three year $750,000 grant. Another $750,000 grant was awarded to the UND ILMH project in 2015. Teams of students already have successfully completed 10-day and 30-day missions in the ILMH. De León says much longer multi-month missions are planned now that the ILMH’s five modules are in place. “When it becomes fully operational, we’ll issue a nation-wide call for personnel to crew the habitat so that we can do long-duration missions on regular basis,” he said. Today’s ILMH team consists of 11 graduate students, but several dozen have been through the Space Studies program. Most of those graduates now are working for NASA or for contractors such as Lockheed Martin and Boeing. The Space Studies program’s first Ph.D. student Kavya Manyapu (who works at Boeing in Houston) will defend her dissertation next month. Manyapu is an aerospace test engineer, a designer of Boeing Company’s Commercial Spacecraft, and a participant in the Mars Society research project that will someday prepare humans for life on Mars.